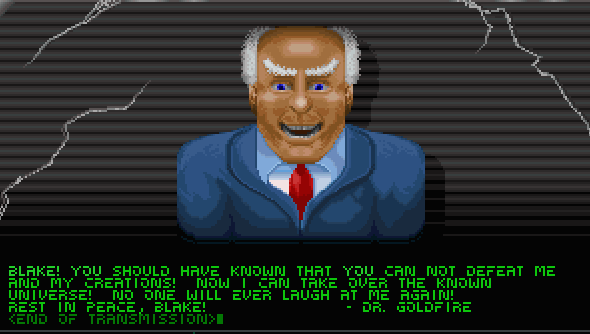 Released way back in 1993, Blake Stone: Aliens of Gold could have been the next Wolfenstein. It used Id’s shooter engine, told the story of a glamorous hero in his battle with space aliens, and was by all reports was quite good. Unfortunately for developer JAM Productions, one week after it went on sale Id released Doom. Still, despite narrowly missing fame, publisher Apogee Software released a sequel. The source code of which, after 20 years, has now been released for free. Apogee recently released The Apogee Throwback Pack on Steam, and to draw attention to this fact the publisher has released the code. It’s worked, my attention has been drawn. The series had you drop into the boots of British Intelligence agent Blake Stone in his battles against Dr. Pyrus Goldfire, a geneticist with plots thicker than concrete soup. Stone fought aliens, genetically modified humans, and mutants. The Blake Stone games had everything but a sense of moderation. This is no bad thing. You can access the code from here should you want to see how games were developed back in the 90s.